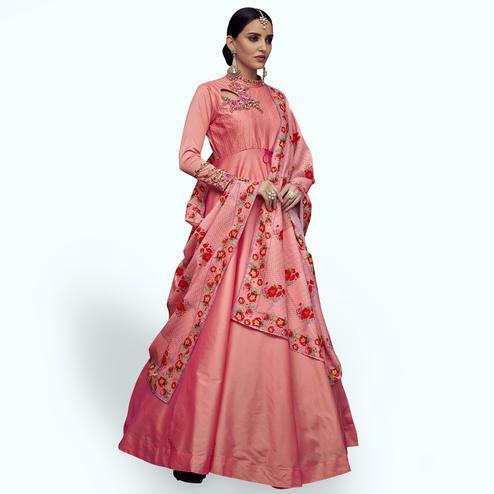 This peach color floor length anarkali suit is sure to make any women look beautiful and outstanding. This semi stitched outfit has got georgette fabric kameez having keyhole neckline net fabric back elegant design zari embroidery and stone work done at yoke and sleeves. Available with matching color santoon bottom and chiffon dupatta enriched with lace border and motifs. Best suited to wear for wedding functions receptions and occasions where you want to appear in ethnic avatar.